GET READY FOR CHRISTMAS! STITCH DECORATIVE MOTIFS FOR A CHILD’S FIRST CHRISTMAS STOCKING! We’ll be issuing a newsletter regularly, with a new free design each time... exclusively created for the VIVA ZIVA! newsletter. WE’RE STILL BUSY AS EVER CREATING NEW DESIGNS AND PAINTING CANVASES! We thought you would like to see some of our RECENT PAINTINGS . PLUS…… NEW DESIGNS RELEASED for ART NOUVEAU CARPETS AND ANOTHER STAINED- GLASS CUSHION to add to ZIVA’s popular Stained Class Cushion Collection. A ‘NOTE TO SANTA’ POCKET FOR A CHILD’S FIRST CHRISTMAS STOCKING! 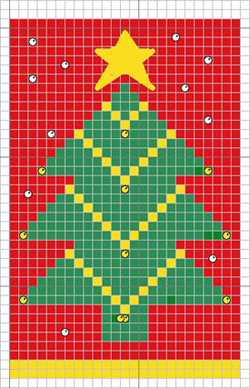 This motif above, “A Note to Santa”, and other Christmas-themed motifs (gifts and Christmas trees) have been created to attach to an existing Christmas Stocking…. or one you can make up! No time before Christmas to make the whole stocking? We also suggest other uses for the decorative motifs …..for a very special Christmas! We are also featuring the Penelope canvas to get the details on Santa Claus’ face just right for our "A NOTE TO SANTA" pocket design. …. guaranteed to bring joy to a child’s first Christmas! Click here to see our newsletter back issues. 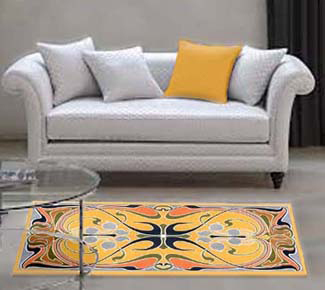 NEW ART NOUVEAU CARPET DESIGNS ARE HERE! The ‘Clematis Buds’ carpet design (above) is just one of three new Art Nouveau carpet designs NOW AVAILABLE! Go to Art Nouveau Area Rugs and have a look! The ‘Clematis Buds’ motif has all the design elements of classic Art Nouveau present in its elegant design… fluid floral theme, natural sinuous contours, whiplash curves, and shapes inspired by nature. I love how well it complements this modern sofa with its lovely elegant curved arms. Custom sizes are always available, just contact us! 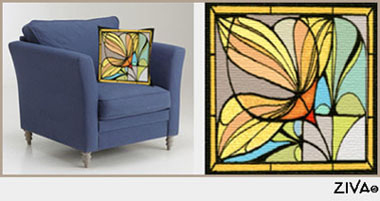 ZIVA PRESENTS NEW STAINED GLASS CUSHION DESIGNS! We’ve adapted this Art Nouveau motif to create an elegant, lyrical stained-glass cushion design, called ‘Saffron Day Lily’. Have a look at how we re-worked this design for an exquisite Art Nouveau area rug, called 'Day Lilies'! 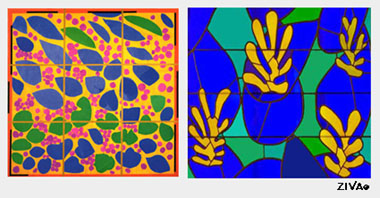 A stained glass collection wouldn’t be complete without a few Henri Matisse’s iconic designs! We adapted two of Matisse’s stained glass patterns, called ‘IVY IN FLOWER’ and ‘VENCE’ to add striking bold colours to to-day’s neutral contemporary interiors. Learn more background about them! A contrasting mix of recent paintings ! 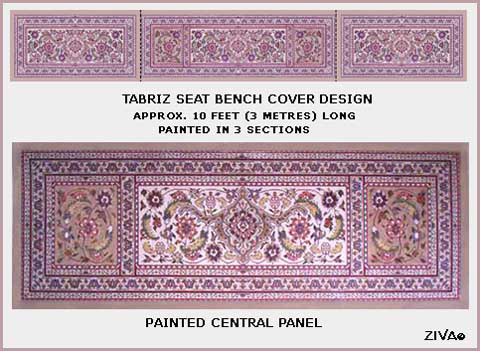 This Tabriz seat bench is a perfect example of how we customize our designs! We took our Tabriz piano bench and reworked the intricate individual sections of borders and central motifs to create a seat bench almost 10 foot (3 metres) long! For ease of hand-painting and stitching, we divided it into three sections, with a plain border separating each section. The lower image shows the detailed hand-painted central panel ready to ship out! AND THEN WE PAINTED TWO DIFFERENT CANVASES! We took our standard Matisse’s Snail design (above left), at 24” square, and reworked the proportions to suit our client’s requirements to create a very different CUSTOM DESIGN at 12” x 18” (painted above right). Happily, it still looks fantastic! We used the very traditional 19th century method of using the Double Thread or Penelope canvas, which is ideal for adding a lot of detail in certain areas (at 20 holes per inch) and a larger stitch for other areas (at 10 holes per inch). 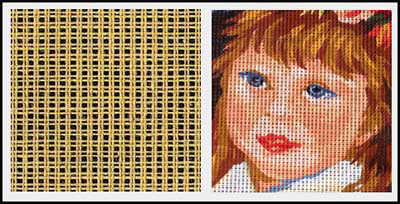 This image of a printed Penelope canvas of a child’s face (above right) shows how the subtle nuances in her skin colour are possible. For the Santa Claus motif and other patterns where you want detail in specific areas only, stitch over single threads using the Tent stitch with a fine needle (#24). The rest of the motif, e.g. the star and background, stitch over pairs of threads, with a larger needle (#16). 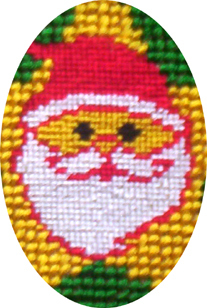 You can see the contrast between the two stitches in this close-up of SANTA’S face, hat and beard! PRACTICE THIS NEW STITCH FIRST! Keep practicing on a piece of Penelope canvas until you feel you are ready to stitch the free design. We wanted to create a very tactile design in classic Christmas colours of Red, Silver, Gold and Green to appeal to a child’s senses! First we designed a small pocket for your child to put in a note for Santa Claus….. the star of the show with his tasseled hat! Together with the stitched textures of our other free motifs of gifts, and Christmas trees, we are suggesting adding tassels or pom-poms, beads, ribbons and a Christmas bell! Also, to add to the effect, we left the canvas exposed in some of the backgrounds of the motifs and painted them red, silver and gold! All these free decorations are attached to an existing purchased stocking or ……one made up using white felt for the cuff and red felt for the rest of the Christmas stocking. The chart above is shown at 20 holes per inch, which is the smaller single thread stitch. If you want to use the double thread larger stitch at 10 holes per inch for the star and background (as shown in stitched image), simply double the stitches and use the chart as a reference. 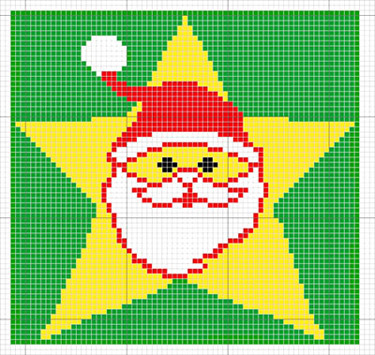 Stitch Santa’s head first and work the star and background larger stitches after. 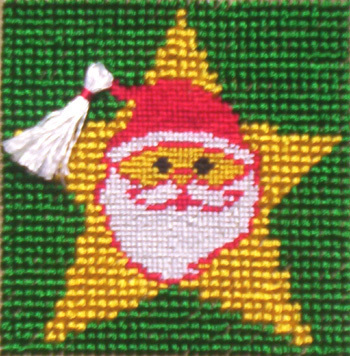 When the single thread stitches and the double thread stitches are side by side (Santa’s head vs the star and background), use a ‘compensation stitch’ of the single thread stitch to fill any small gaps. Or you could stitch the entire pocket in the smaller single thread stitch. You could stitch the pom-pom on Santa’s hat as shown as part of the pattern or you could add an actual pom-pom or white tassel after the stitching as we did. You can sew the pocket directly to the stocking, or you could add a small gusset to the pocket around three sides, to give the pocket more depth. We painted the canvases BEFORE stitching the motifs: gold on the candy cane canvas and silver for the other two. We suggest the Sloping Gobelin stitch for the gold stars and the straight Gobelin stitch for the small graphic trees. Add small pieces of lining in gold or silver to the back of the painted canvases to make the colours even bolder! Glue or hand sew metallic threads or small ribbons to simulate ribbon and bows on the gifts. NO CHART! There are so many sites with alphabet fonts for needlepoint to choose from for your reference for stitching the child’s name. We used 14 hpi interlock canvas for this motif and stitched the Verdana font letters in the Tent Stitch at 1” (2.5 cm) high. A nice bold and simple font for a child to read his/her name in time. You could also glue small silver beads on the gold exposed canvas, to add more glitter! All the yarns for the motifs for the child’s first Christmas stocking were chosen from DMC SATIN threads range of colours. They are readily available at your local needlepoint shop or online. As a guide, you will require approximately two skeins of all the colours, andoneskein of the black, for the ‘A Note to Santa’ pocket. Depending on what other motifs you decide to stitch, select two more skeins at least for each colour. No more black thread is required. Antique-coloured Penelope canvas at 6” (15 cm) square for pocket. White 14 mesh (hpi) interlock canvas for the remaining motifs. Always allow 1” – 2” additional to the above sizes on all sides of the stitched areas. Needlepoint Needle: For 14 mesh canvas, use size 20 needle: For Penelope canvas, use 24 needle over single thread, and 16 needle over double threads. In a rush at Christmas? 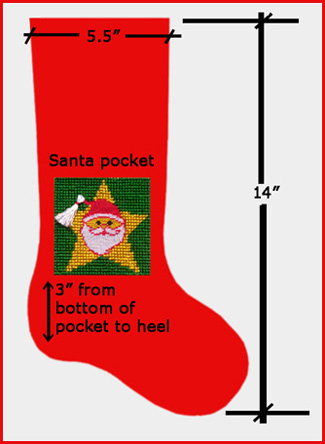 Then purchase a ready-made red Christmas stocking (with a white cuff) in a similar size (if possible) to the one shown. If you have time, you’re a sewer and prefer to make your own, you will need red felt cut in the size and shape shown and white felt at 3-4” high (approx. 7 – 10 cm) x 11.5” (28.75 cm) long. Add 5/8-inch seam allowances to these measurements. You will also require lining for the inside of the stocking. 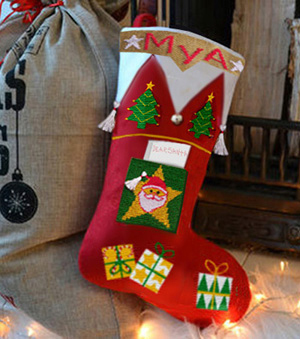 Hand sew the various motifs to the stocking in the positions you want! I HOPE YOUR SPECIAL CHILD LOVES THE CHRISTMAS STOCKING! HAPPY HOLIDAYS! I’m interested in Pines and Needles cushion. Are most items in stock and ready for shipping? We have approximately 150 designs on our website. We can't possibly stock that number of hand-painted canvases, considering a great many of our orders are custom to suit a certain client’s requirements. For example, the Pines and Needles motif that you are interested in is available as a cushion as you know, but it also has been adapted to suit the dimensions of a client's footstool. Likewise, we have adapted some of our standard designs to fit window seat benches, piano benches, dining chairs, etc. NOTE: Also included in this newsletter, (above under Recent Paintings), we have shown the standard Matisse’s Snail cushion at 24” square, and the custom size at 12” x 18” we were asked to create. Hoping you’ll let us create something for you in the future! The next VIVA ZIVA! Newsletter #1924 will be issued in the spring of 2019 .